Status: Rare local regular resident Panhandle. Uncommon regular winter visitor west, rare casual central, accidental east. Documentation: Specimen: UNSM ZM7644, 13 Dec 1895 Fort Robinson, Dawes Co.
Taxonomy: No subspecies are recognized by Clements et al (2017) or Gill and Donsker (2017), although Pyle (1997) accepted three weakly-differentiated subspecies: cassini from Oregon to Idaho and south to Nevada and New Mexico, rostratus, of southeast California, and cyanocephalus from Montana to North Dakota, south to northern Colorado, including the South Dakota Black Hills. Phillips (1986) indicated that birds reaching northern and northwestern Nebraska after breeding were of the eastern Rocky Mountain subspecies cyanocephalus, which breeds in the South Dakota Black Hills and the Rocky Mountains to the west of Nebraska. Resident: Important in understanding movements of this species is its propensity to form permanent flocks that consist primarily of related individuals (Balda 2002). According to Balda, fledglings tend to stay with the natal flock for their lifetimes. During the breeding season, breeders separate from the main flock and form a nesting colony nearby. After young are fledged the breeding group re-joins the main group, which then becomes nomadic until the next breeding season, when it returns to the breeding site used in previous years (Balda 2002). The breeding status of this species in Nebraska was discussed by Mollhoff (2000), who suggested that the range may have contracted in modern times. During the first BBA the species was found in 10 survey blocks, but during the second BBA period Pinyon Jays were found in only 6 of those blocks, despite a 30% increase in effort (Mollhoff 2016). Pinyon Jay is a species of significant conservation concern that has declined by as much as 84% since the 1970s (Rosenburg et al 2016). BBS trend analysis shows notable annual declines ranging from 3-6% for Colorado, Wyoming and South Dakota (Sauer et al. 2017); trend analyses are not available for Nebraska due to small sample sizes. Pinyon Jay would seem vulnerable to extirpation in Nebraska given rangewide and regional declines in numbers and since Nebraska’s populations are small and disjunct. In addition, it has been pointed out by Mollhoff (personal communication) that Nebraska residents survive on an atypical diet for the species, ponderosa pine seeds, which are much smaller than the species’ typical diet of pinyon nuts; this difference may alter the reproductive biology and movements of the species in Nebraska. Breeding had never been confirmed in Nebraska until Mollhoff (2001a) reported adults feeding young 22 May in Scotts Bluff Co and 29 Apr-9 Jun in Sioux Co in the period 1984-89. A nest with eggs and newly-hatched young was located 11 Jun 1999 in ponderosa pine woodland in East Monroe Canyon, Sioux Co; the young were well grown on 25 Jun and absent on 13 Aug (Mollhoff 2000, 2001b). An active colony with 10 nests under construction was found on the Bighorn Escarpment near Redington in Morrill Co 29 Apr 2001 (Mollhoff 2004); this same site was occupied by four nests with 4-5 eggs each 17 Apr 2006 (Mollhoff 2006). In 2010, 2-3 were located along Corkscrew Road in Sioux Co 16 May in an area they occupied in 2008; these birds were building a nest, which may have been a second attempt at that date. A family group in Smiley Canyon, Sioux Co 14 Jun 2003 may not have nested in the immediate area. The only recent breeding season reports are from the Pine Ridge and the Bighorn Escarpment in Morrill Co; breeding has not been detected since 1989 in the Wildcat Hills. Rosche (1994) noted that the species “reaches eastern limits” in the Bighorn Escarpment, presumably the area near Redington mentioned by Mollhoff (1999). This site has a consistent history of breeding season sightings. About 10 birds were there Apr and May 1987 (Williams 1987) and flocks of 5-75 birds, including fledged young, were seen with young of the year 16 May 1998 (Mollhoff 1999). 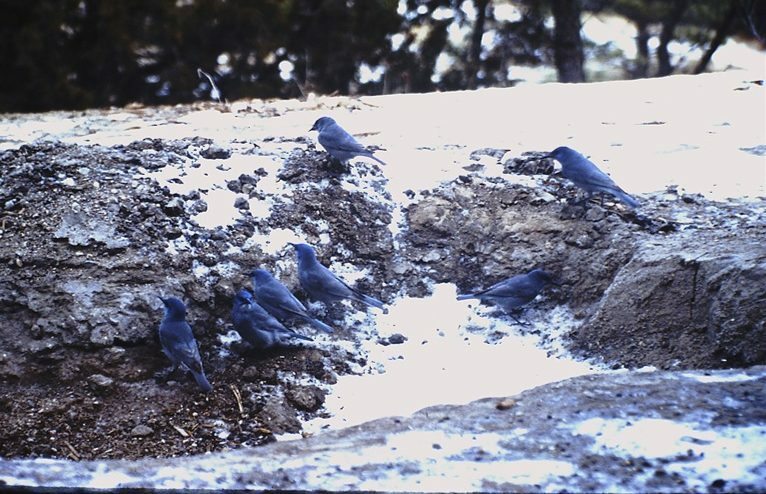 Mollhoff (1999) also found two nests that he believed were unlikely to be of Pinyon Jay, noting that that particular flock’s nesting site was still unknown. Nine empty nests located seven miles southwest of Redington 14 Apr 2001 were thought to be the remains of a nesting colony there 1999 or 2000. A feeder regularly used by this species in the Bighorn Escarpment in Morrill Co hosted some 20 birds during the summer of 2014, perhaps representatives of the local breeding flock. Two were at Potter, Cheyenne Co, some 20 miles to the south, 9 Jun 2017. Reports are fewer in summer than at other seasons (Rosche 1982). Around 1900 it was thought to have bred on the Pine Ridge east into Sheridan Co almost to the South Dakota border (Bates 1900, Bruner et al 1904), but the only nesting season report from Sheridan Co since then is a listing as “Permanent Resident” in 1992 without details. Winter: This species is highly gregarious most of the year, and flocks may cover considerable distances in search of food outside of the breeding season (Bent 1946). Large numbers are sometimes seen at feeders in towns, such as the “invasion” in Chadron, Dawes Co in Sep 1985 (Williams 1986), and in Scotts Bluff Co, where 350 were counted on the 18 Dec 1971 Scottsbluff CBC. High CBC counts of 170 were also made at Crawford in 1977 and 1978. Rosche (1982) stated that numbers are higher in fall, winter, and spring than in summer, and suggested that local populations may be augmented by birds from “presumably further west” (see also Phillips 1986), although there are no banding data to support this. A remarkable report with a photo of at least 84 Pinyon Jays was taken 17 Feb 2014 in a yard northwest of Dalton in Morrill Co; 80 were there 1 Nov 2014. Pinyon Jays occur irregularly east of the breeding range, mostly in the Platte River Valley, but rarely east of Lincoln Co, where Tout (1947) considered it an irregular winter visitor 16 Sep-5 May, and Logan Co, where Glandon and Glandon (1934) noted that “a small flock appeared almost every winter.” A small flock of five was seen in southeast Lincoln Co 30 Oct 2016. A group of 11 which appeared at Wind Springs Ranch in southern Sioux Co 28 Jul 2006 may have dispersed from the Pine Ridge or elsewhere in response to extensive fires there. A “small flock of seven or eight” was near Hastings, Adams Co 16 Oct 1934 (Swenk 1935), it was reported near Kenesaw, Adams Co fall 1937 (Brooking 1938), and 8-10 were near Osceola, Polk Co Nov 1930 (Jorgensen 2012). Such reports in recent years are few, but a localized irruption was noted in the Ogallala area, Keith Co 2002-2003, when one was five miles northeast of Lake McConaughy at a feeder in early Dec 2002, a group of five were in an Ogallala neighborhood from about 1 Dec 2002 through at least 16 May 2003, and one was photographed in Chase Co 3 Dec 2002 (Brogie 2003). A group of seven was in Ogallala 6 Nov 2012, the first there “for several years”. Easterly reports for Nebraska include one photographed at Norfolk, Madison Co 26 Nov 1985-20 Jan 1986 (Williams 1986), a specimen, HMM 2517, collected at Hastings 20 Oct 1926, and a single at a Kearney, Buffalo Co feeder during the winter of 1996-97 (Brogie 1998), the same winter one appeared in central Iowa (Crim and Crim 1997). There is a newspaper report of about 40 wintering in Pierce Co 1930-31 (Swenk 1934) and a flock of about 100 wintered in Madison Co 1931-32 and that returned in Nov 1933 (Swenk 1934). Brooking reported one at Hastings 10 Oct 1926, likely the same bird collected there 10 days later (above; Jorgensen 2012). Curiously, there were no Nebraska reports for 1972-73, when a major corvid irruption onto the Great Plains pushed two Pinyon Jays to southwest Iowa, providing that state with its first record of the species (Kent and Dinsmore 1996). Photograph of Pinyon Jay at the Wildcat Hills Nature Center, Scotts Bluff Co 11 Jan 1997 by John Sullivan. Balda, R.P., and G.C. Bateman. 1972. The breeding biology of the Pinyon Jay. Living Bird 11: 5-42.The breeding biology of the Piñon Jay. Living Bird no. 11:5-42. Brooking, A.M. 1938. Some bird notes from Hastings, Adams County. NBR 6: 17. Crim, L., and G. Crim. 1997. Pinyon Jay in Boone County. Iowa Bird Life 67: 64-65. Mollhoff, W.J. 1999. 1998 Nebraska Nesting report. NBR 67: 108-114. Mollhoff, W.J. 2000. Review of the breeding status of Pinyon Jay in Nebraska. NBR 68: 126-131. Mollhoff, W.J. 2001a. The Nebraska Breeding Bird Atlas 1984-1989. Nebraska Ornithologists’ Union Occasional Papers No. 7. Nebraska Game and Parks Commission, Lincoln, Nebraska, USA. Mollhoff, W.J. 2001b. 1999-2000 Nebraska nesting report. NBR 69: 92-101. Swenk, M.H. 1934. The 1933 Migration Season. NBR 2: 11-19. Swenk, M.H. 1935. The 1934 Migration Season. NBR 3: 35-43.